By Pixie, in 'Non-Latin Talk', Jul 27, 2012. 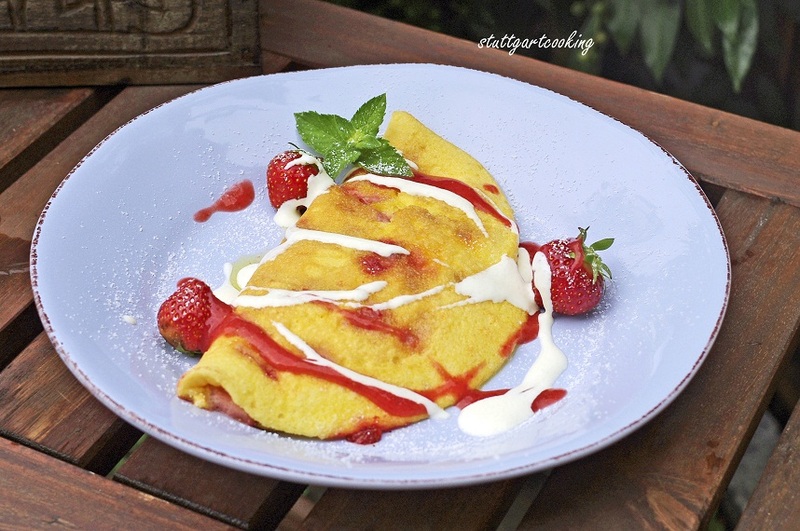 Combine egg yolks with sugar, sifted flour,, salt, and milk to make a paste fold in stiffly beaten egg whites. Melt 1/4 the Butter or margarine in a large skillet arid pour in 1/4 the mixture. Fry slowly until it puffs turn and1 brown, other side. 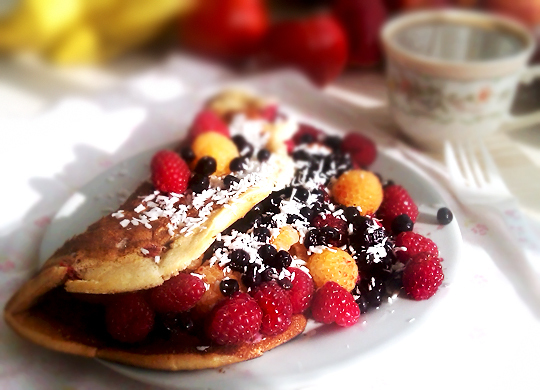 Tear off small pieces of the omelet with 2 forks and place on dish with powdered sugar which has been kept with vanilla bean. Cook other omelets and add in the same manner. When all omelets are cooked, torn in pieces, and mixed with powdered sugar, return to skillet with 1 tbsp butter or margarine and the raisins, and heat through. Hawkwood, Decimvs and Bestiola like this. I add the peppers right into the whisked egg mixture; the heat of cooking serves to soften them up just slightly, but not enough to make them squishy. I sometimes just eat slices of tomato on the side; I cut a piece from the omelet, cut a piece of tomato, and stick both with the fork. But, you can add them in to the pan, you just have to do it right before you fold the omelet -- you are right; too much time in the pan, and the tomato pieces can get too soft. Also, not using the very center part (seeds and jelly) of the tomato helps. Just use the thickest and more firm outer areas. I think of it like a stir fry; the ingredients that I don't want to lose their firmness go in last. Seeking translation? Please take a moment to read our Disclaimer and Guidelines. Thank you for the tip Decimvs. I will put it into use. 1 Cream the butter and sugar on high speed for about 3 minutes. 2 Separate the eggs. Add the yolks and vanilla extract to the butter mixture. If using nuts place the egg whites in a shallow dish on the side and whisk them until bubbly and frothy (the egg whites will be used to keep the nuts on the cookies). 3 Add the flour and salt. Mix until just combined. Place the dough in the fridge for 30 minutes and preheat the oven to 350F. 4 Roll the dough into balls about 1 inch in diameter. If using nuts, dip the balls into the egg whites then roll them into the nuts until covered. Place the balls on parchment lined cookie sheets. 5 Press down with your thumb to make a small well in the center of the cookie. Do not press too hard or the cookie will fall apart. Fill with 1/2 teaspoon of jam. 6 Bake for 12-15 minutes or until slightly firm. Allow to cool for a few minutes on the cookie sheet to firm up before moving them to a wire rack to finish cooling. Yield: Makes 2 dozen cookies. "Do not be afraid. Do not be satisfied with mediocrity. Put out into the deep and let your nets out for a catch." - Bl. John Paul the Great. I post from my phone, so if something does not make sense it's most likely autocorrect. I took up baking over the summer. I mainly make thumbprint cookies with raspberry jam an chocolate sprinkles. This sounds excellent. I have never used jam when making cookies. I might give this a try. Thanks for the post! Before you put it in the oven, put the jam and sprinkles on the cookie and it gets rid of the seeds, either that or I just didn't notice the seeds. They ask for a little too much salt though, I cut the salt down after the first time. I've also been making salsa lately and French toast lately. For the salsa it's all trial and error, you just have to eye it up. It doesn't matter what order you add the spices in, just as long as they're in there. The only problem is I don't have a set recipe, I just do a taste test with some chips. Put raisines into hot water for about 10 minutes. Then strain. Combine all filling ingredients. Beat well and set aside. In a small heatproof bowl, dissolve yeast in 1/2 cup of the warm milk. In the bowl of a stand mixer or a large bowl, combine flour, sugar, salt and eggs. Add remaining 1 1/2 cups warm milk, butter and yeast mixture. With the paddle attachment, or by hand, beat until smooth. Dough will be sticky at this point. Scrape dough into a clean, greased bowl. Sprinkle the top with a little flour and cover. Let stand in a warm place for 1 hour or until double in size. Punch down dough and turn out onto a floured surface. Divide dough in half and shape each half into a rectangle. Spread 1 can or half of the filling you made on each rectangle of dough and roll up like a jelly roll. Turn ends under so filling will not leak out. Place on a parchment-lined or greased pan, cover and let rise again until double in size. Heat oven to 350 degrees (ca. 180 Celcius) . Brush tops of rolls with additional melted butter. Bake 45 to 60 minutes or until rolls are golden brown. Remove from oven and cool. Dust rolls with confectioners' sugar, if desired. Careful, crowd. I just received a DMCA removal request from our host for one of the recipes posted in this thread. I removed the reported post, but in the future don't copy large chunks of text exactly (especially without a link to the original source). Tell us of what you learned in your own words. 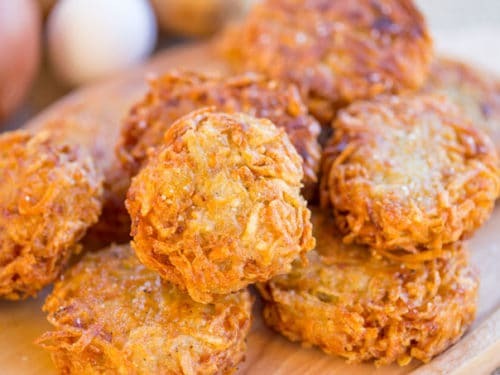 Latkes are versatile - you can eat them as seperate dish with all sorts of dips or as substitute for potatos/ frites/ silesian dumplings etc. frying oil: I use regular canola oil. 3. Put the basis in a bowl, add rest of ingredients , mix everything for 5 minutes, ensure everything is fully mixed throughout the potato shreds. Tip : if latkes aren’t holding together, add more potato starch into the mixture, slowly until the batter “holds”. 6. fry about 2 minutes on each side untlil it's golden brown. 2. Salt - don't be afraight to add salt. Salt enhances flavour of a dish or drink. ( for example try Black coffe with a small pinch of salt added - you'll notice the different taste) . Salt as seasoning should be added first. The earlier you start seasoning, the deeper and more concentrated the flavors will become. When cooking meats (especially pork and venison) make sure to salt and tenderize with a fork the night before. - crushed garlic cloves taste strong, whereas sliced or coarsely chopped garlic cloves taste milder. Intact garlic cloves are mildest of all. Mashing minced garlic with a pinch of coarse salt can help tame the harsh flavor. Here are some photos from the Roman-inspired meal I made the other night. I took the recipes from an interesting website called Pass the Garum (not sure how "authentic" they are). Some things were definitely better than others! When I made the date paste for the roast dill chicken, it looked like mushed-up cockroaches (see photo below). Luckily, it didn't taste *quite* that bad when I put it on the chicken. I also made the "buccellatum" biscuits I mentioned in a previous thread. The last photo is of the dessert "placenta" which sounds really disgusting in English but is actually quite delicious and sort of similar to a baklava. View attachment 4884 View attachment 4883 View attachment 4887 View attachment 4885 . If you are interested , I found this material of some use as far s roman cookery is considered.